Productivity was reported as down in the UK in October 2017, and in Australia in January 2018, and whilst it was only marginally down in the US in the same month, there are always areas for improvement. But how do you go about making yourself and your team more productive? Here are four easy hacks to ditch the temptation of procrastination and get better results! Rather than attempting to slave away at the same task for hours on end, break your work up into smaller chunks that can be completed in a shorter time. Research varies on best length of time to work for – some say 52 minutes, some say 90 – so figure out what works best for you, and make sure to take short breaks between each working ‘block’. Though it may sound counter-productive, it’s been proven that this way of working actually boosts your concentration and allows you to invest more energy and focus into each task that you do. Start experimenting with hour-long sessions and go shorter or longer from there, depending on when you feel your concentration slipping, then apply the ‘block’ system to your work day. An unmanaged email inbox is a slippery slope – one or two unopened emails can lead to hundreds before long. If you’re not in the habit of keeping your inbox organised, the initial clean up may be daunting. However, once you get it done, not only will you feel a lot better, but also, managing any new messages will be a lot easier. Start by sorting your existing emails by date. You may want to do that by year or by quarter – for example, 2017, or 2017-Q1. Don’t create a folder for the current year or quarter, as the emails for this time period are still incoming. For those incoming emails, you can set up and apply filters to sort them into different folders. A good way to sort could be by client, for example. Set up the filter as all the email addresses you have in your contacts belonging to a particular client’s business – for example, if you receive emails from the office manager, Greg, and the owner, Lucy, of a business named ABC Books, you would add greg@abcbooks.com and lucy@abcbooks.com. From there, select an action for the filter, so in this case, that action is ‘Send to Folder’ > ‘ABC Books’ or the equivalent on your email client. Already your inbox should be looking a lot neater! Of course you don’t have to organise your inbox in this way at all, but whatever system you decide on, stick to it. A process can’t be effective if you give up on it after a month. And remember that if you don’t need an email for later reference, delete it! Nowadays, with more and more workplaces offering flexible hours and mobile working, the line between work and life is becoming steadily blurred. However, leading research institutions hold firm that a work-life balance is important for your mental health and your productivity. Set realistic goals for what you want to achieve in a day, and try to complete those goals by the time you leave the office. If you don’t get everything done, that’s ok! You can neaten up any loose ends tomorrow morning and know your capacity better for future. A good way to make sure you’re checked out for the day is to make a list of those outstanding tasks or things that need doing tomorrow. After you’ve written it down, leave the list on your desk and leave the office. The important thing is that once you leave the office physically (even if that office is within your own home), you also leave the office mentally. 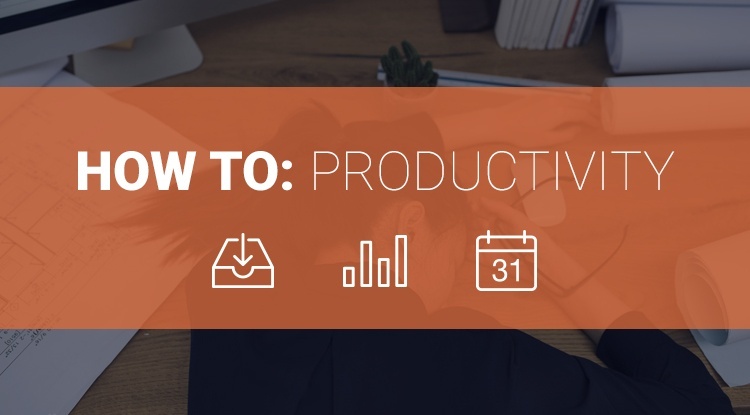 Workplace productivity software is called exactly that for a reason. There are so many tasks that can be automated, or at least be made easier, by tech. Take for example project management – it’s difficult and time-consuming to ensure visibility, chase people up, assign tasks effectively and so on. Try using a software such as Asana or Trello – suddenly this all becomes much easier, and missed deadlines become a thing of the past. Manual data entry is similarly time-consuming, but it doesn’t have to be that way. With Receipt Bank, your clients simply snap a picture of a receipt with our mobile app, or forward an invoice on to a personalised email address. Our data extraction software then feeds all the relevant information into a dashboard for you, so that all that’s left to do is approve the transaction and send it through to your accounting software. Imagine eliminating data entry from your day-to-day tasks – now that’s productive!